There's no doubt that James Cameron's Avatar in all its 3D blue-and-green beauty is a worldwide phenomenon, grossing millions upon millions of dollars and becoming a word of mouth sensation. With such a wave of success comes James Cameron's Avatar: The Game from Ubisoft, with its oft-heard promises of being an interactive experience to complement the movie, expanding the story and so on. Fittingly, it matches the movie in one key area: by pleasing despite its obvious formula. 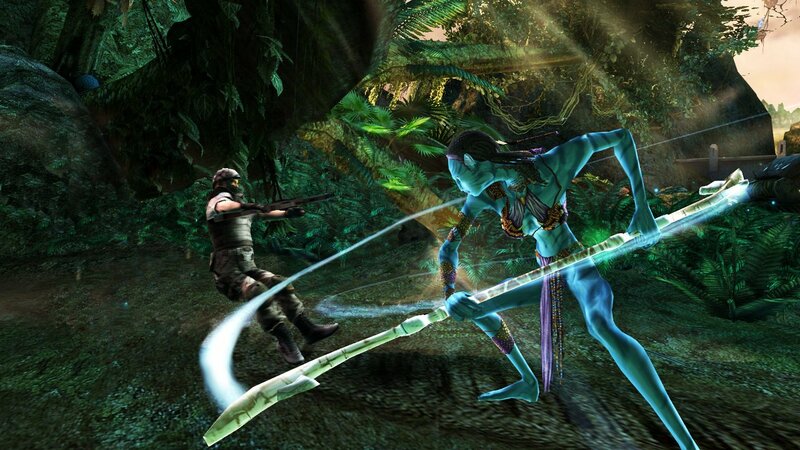 Taking the role of a Na'vi hunter, the game is split into two main sections: a third-person stealth-based adventure and an aerial shoot 'em up, which you flit between four different missions. The on-foot sections aren't exactly Metal Gear Solid or Splinter Cell in their stealth approach - your options are limited to sneaking in tall grass or sneaking on tall ground. In fact, of any pseudo-stealth game it most resembles Beyond Good and Evil, particularly in the way your character handles, and those familiar with Jade's last-gen escapade will be immediately at home with the stealth-and-staff gameplay. 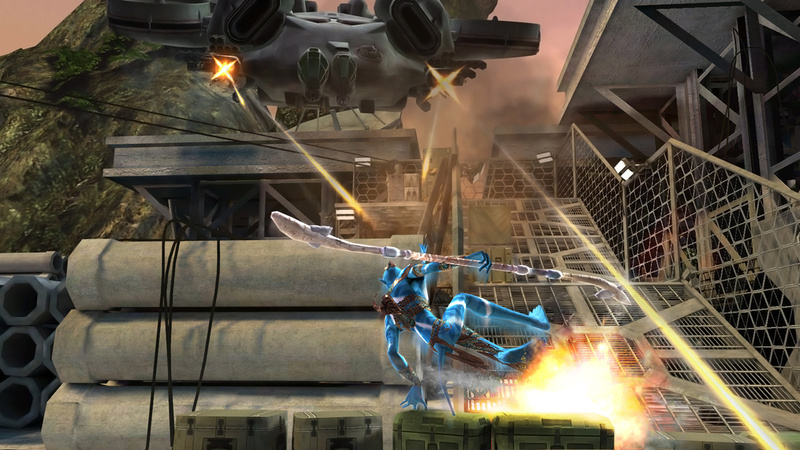 Despite supporting the MotionPlus accessory, the combat is simplistic, with vertical swipes attacking to your front and horizontal movements attacking in an arc, hitting more enemies. Emerging victorious from combat is a matter of swinging your Remote whichever way you please (there's no 1:1 tracking for MotionPlus here) to clobber the enemies at hand, although performing stealth attacks is much simpler, requiring a well-directed Remote swipe at the right time. It's not always replicated 100% accurately however, making it frustrating to sneak up on a soldier, land on him and the game detect the movement incorrectly, forcing you to tackle him and his comrades in battle. There's also another MotionPlus feature, the Hell Wasp, though it ranks as even more pointless than Ubi's effort to incorporate the add-on with Academy of Champions. The wasp is essentially a nuisance, designed to fly through the air and sting your opponents, stunning them just long enough for you to run up and finish the job. The controls are so inaccurate that after trying it a few times you'll ignore the opportunity in future as it's simply not worth fiddling with. Once you move onto the aerial section - which got the Panzer Dragoon fans among us rather hot and heavy - you'll find the controls here take the road less-travelled. The Remote's IR pointer acts as your reticule, but you move your Banshee using the Nunchuk's accelerometer, a scheme that though pleasing at first, brings problems against larger enemies. Essentially you never have the immediate reaction time afforded by a traditional analogue stick, making avoiding mines and enemy fire a matter of learning patterns or spotting them early. There's some considerable charm to piloting a huge patterned dragon with free-flowing Nunchuk movements, but once the intensity ramps up it becomes an exercise in frustration rather than freedom. There are similar control mistakes throughout. Opening a case or door is a matter of waggling until the game tells you to stop, and there are quick time events for major bosses that, if performed or detected incorrectly, return you to the combat with the boss's health restored. Yes, it's one of those games. Whilst Ubisoft is to be applauded for creating a title specifically for Wii, rather than bringing a reduced port to the machine, it's still disappointing to see poorly conceived control schemes happen after over three years and the extra accuracy afforded by MotionPlus. Despite these control criticisms, the gameplay still manages to be quite enjoyable. Leaping down on unsuspecting soldiers and pummelling them with the Remote is undeniably fun, as is flying through canyons, shooting down helicopters and taking in all the tried-and-tested action film elements. It may lack innovation, but it borrows from the best and though it never hits the heights of Beyond Good and Evil, Panzer Dragoon or the Zelda series (another influence) it's not an unmitigated disaster. The drop-in, drop-out cooperative mode, for example, is a lot more fun than perhaps it has right to be. Whilst it's not quite as enjoyable as the Lego series, working together to clear enemies from the jungle whilst remaining unseen is undeniably exciting, though naturally it suffers from camera problems if the two of you decide not to stick together. It also manages to stand alongside some of the Wii's better-looking titles, with crisp detail and good use of colour and texture. The whole thing runs smoothly enough, though there is noticeable slowdown in some busy areas, and there are some nice explosion and lighting effects throughout. It's not the most mind-blowing game you'll see running on a Wii, but it certainly avoids complaints of PS2-quality graphics. Complementing the graphical quality is a decent audio presentation, with voice-overs, orchestral pieces and some suitably sci-fi sound effects rounding out the package. 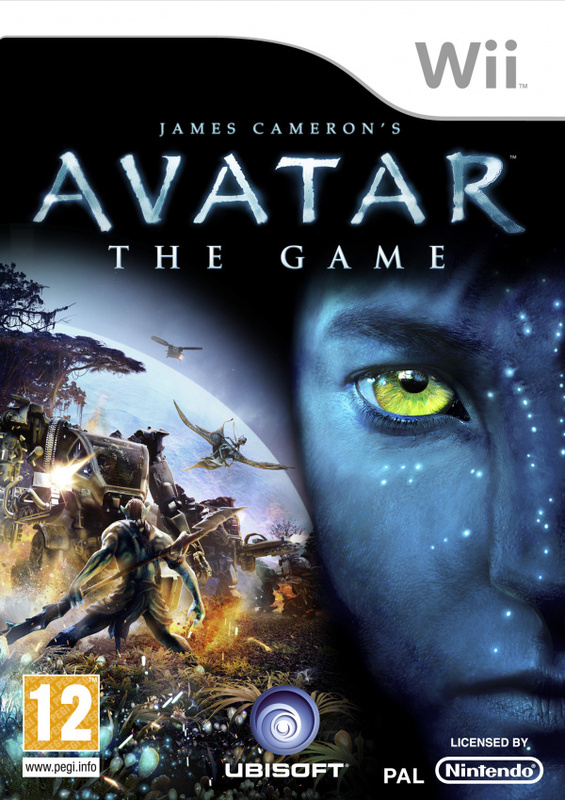 Avatar isn't a bad game, it just rarely rises above the average, despite borrowing heavily from some superb games. The storytelling is weak, it's too short and it has its fair share of control issues, but all the same you'll find yourself having fun with it despite your reservations. If you're a big fan of the movie you may want to give this a rental, but anyone looking for a great third-person action adventure should certainly look elsewhere. "Avatar isn't a bad game, it just rarely rises above the average, despite borrowing heavily from some superb games." Yeah, hilarious comment tealovertoma, shame the movie reviews are all very good. Have you even seen it? Sounds like your typical movie tie in, albeit with a few mildly interesting uses of the wii technology of motionplus and balance board. Other reviews generally agree with this one too. Film was excellent, no surprises with the result of the game though... no surprise at all. @Machu - I think @tealovertoma's comments are more to do with the fact that Avatar - great film though it is - basically borrows elements from lots of other films. Aside from the groundbreaking effects, it's hardly what you would call original. @Damo: I have seen Dance with Wolves a dozen times already, it is one of my all time favourites. People who went to see Avatar expecting more than a visually arresting blockbuster, have only themselves to blame, not the film. I went in, knowing what i was getting, and came out very very satisfied. As for the game. I shall be avoiding. The graphics looks kinda nice, but the game is a...meh. and about the movie, is ok and very fun but the overhype is getting annoying. I dunno why people went bonkers with it...well I do know but still...people should watch more movies out of the hollywood stratosphere and be less naive. Is Ok for the kiddies though. Why no opinion on the featured balance board support? I have this game, knowing well ahead I was only gonna get a glimpse of Pandora and the movie universe. I still enjoyed it a bit, but it's another sad tale of a rushed product to meet release deadlines. A few more polished gameplay would take this far. As it is, "Rogue Trooper" is a similar experience and way, way better. I have the game and I think this review is spot on. Asides that, looks decent enough for a movie tie-in. It's no Robots DS, at least. Nice to see Ubi make the extra effort for Wii. Aww, and here I was hoping this whole time that we'd end up with some kind of RTS game to tide me over until Starcraft 2 comes out! Was a fun action flick but when have we ever had a game come out alongside a movie that didn't turn out to be shovelware? @14: I'd hardly call this shovelware. Just average. As movie tie-ins go it doesn't seem awful. "Despite these control criticisms, the gameplay still manages to be quite enjoyable. 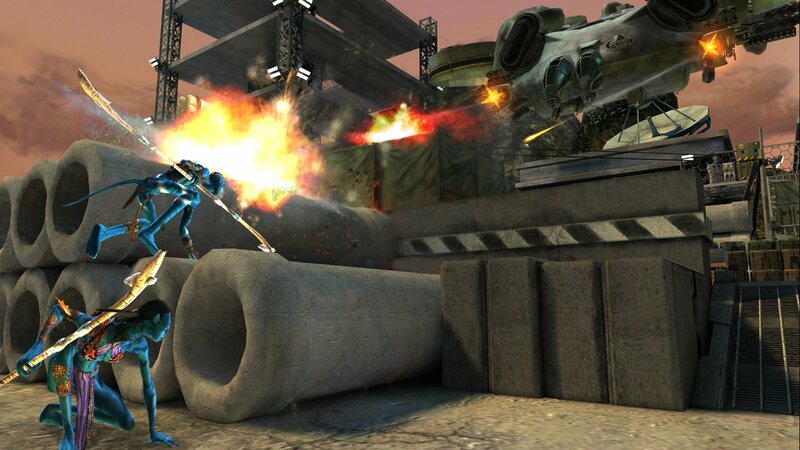 Leaping down on unsuspecting soldiers and pummelling them with the Remote is undeniably fun, as is flying through canyons, shooting down helicopters and taking in all the tried-and-tested action film elements"
For that reason the game deserves a high score, because it really is fun and exciting. You have to be a fan of the film though. I hated the WASP motion plus control, but it IS accurate - you can fly with it and sting the enemies... it's just a stupid use of the motion plus but it does work, and I can see the appeal if I imagine the avatar using his hand too... but it is a fail. The BALANCE BOARD works brilliantly! I only flew the dragon with this, not with the nuncuk, and loved it. Oh look, an average-at-best movie licence! What a surprise! Hmm, not even the best Wii game that begins with the word "avatar." Good points but if you compare this to the film it fails. Also not being rude but it's a banshee not a dragon. @thelawyer - agreed on both accounts. I was distracted/confused by the word "Dragoon". I knew the game wouldn't of been to good. The movie was great. But movie based games usually 99.999999999999999999% turn out bad. Epic Movie --> Mediocre Game --> FAIL! It's a shame, really. My fiance and I originally went to see it in 3D, but somehow they overbooked the theater and thus refunded our tickets as we had nowhere to sit But we came back and saw in 2D the next day at matinee for literally half the price Probably the greatest movie I have ever seen effects wise, though not quite as epic as the Lord of the Rings trilogy. I've always liked the idea of humans being the alien invaders. The graphics in Avatar blew us away; as it's nearly impossible while watching the movie to differentiate between the CGI components and the Live components, so it feels like everything is real. Yes, it's that good! The movie is very overrated. Please direct your attention to the image below. @mnementh I was referring to "Avatar: the Game's" score here, which is lower than the MetaCritic scores for all three "Avatar: the Last Airbender" games (none of which have been reviewed here). @ Blue Protoman - quite true, and funny, but Sci Fi (or anything else) is rarely original and it has to borrow a lot. Would it have been better if Avatar was simply based on a book like most sci fi films? At least it's a new script. Whether the Navi win or lose? Some of these were covered in Fern Gully, Dances with Wolves, Dragons of Pern and so much... but the end result is satisfying. @Dragoon: Apparently, The World Is Not Enough and From Russia With Love don't exist. GoldenEye's the only legendary one, though. We shouldve gotten the same game 360 and PS3 got. None of this stealth crap. Damn, Blue Protoman, I wanted to post this. Just because the movie is hyped, it doesn't mean it's good. Its about the world of Pandora, not the story. Thats where the creativity and Cameron's monster really is. is it available in Philippines cuz im a big fun of it!! is there avatar online game?